float off any dips, humps, or waves on the concrete foundation using a portland cement based floor leveler. For dips, this product may be used to fill the cavity and screed off using a level or straight edge. For humps, apply the floor leveler around the base of the protrusion. Then, using the top of the hump as a guide, screed the floor around the base of the hump in a circular motion. 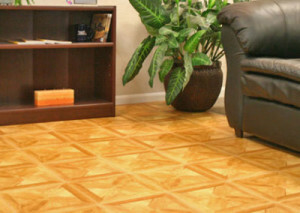 This will help to lessen the impact the protrusion will have on your finished floor. Most Portland cement based floor levelers need to cure for at least 24 hours before the tile can be installed. How to install carpet on a concrete floor. How to glue commercial carpet to concrete in detail.